As my wife aptly pointed out...I missed a letter this month. Unfortunately, I erroneously remembered that the next letter was to be on April 22nd. My mistake...my apologies. 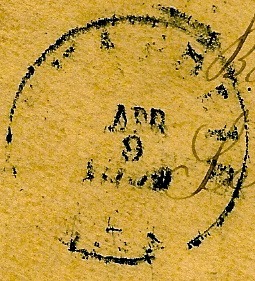 April of 1864 finds the 48th PVI preparing to deploy to Virginia later in the Spring. For six weeks the 48th drilled, paraded, and essentially sharpened their discipline after a 2 month furlough. Complaints were rampant, but this seemingly silly set of dress parades and drilling, would be critical for the survival of most of the regiment. Like a football team coming to Spring training with all the rust and out of shape men, the 48th needed some training to regain their fighting form. Annapolis provided an excellent training ground with easy access to the Chesapeake Bay for transport to the lower peninsular regions of Virginia. The stay at Annapolis did not come without tragedy with a few men of the 48th dying. More specifically, on April 8th, the death of William Smith from John's own Company D. No mention of Smith is made in the letters, but it is probably coincidental that this letter was written on the same day of his death. This letter speaks mostly of family matters. His 20 year old sister Saloma (Salome and Salomy in the records) was off into the working world...going to help the Hepler's as a maid. The Derr family was a poor farming family living on a piece of land that was valued at $1000 in 1860. The family having purchased the farm in the prior decade, the father (Peter), needed all the cash infusions he could get to maintain this marginal piece of earth. For the most part, when the children left the home to work, those monies returned to family to maintain the core family business....in this case...the farm. 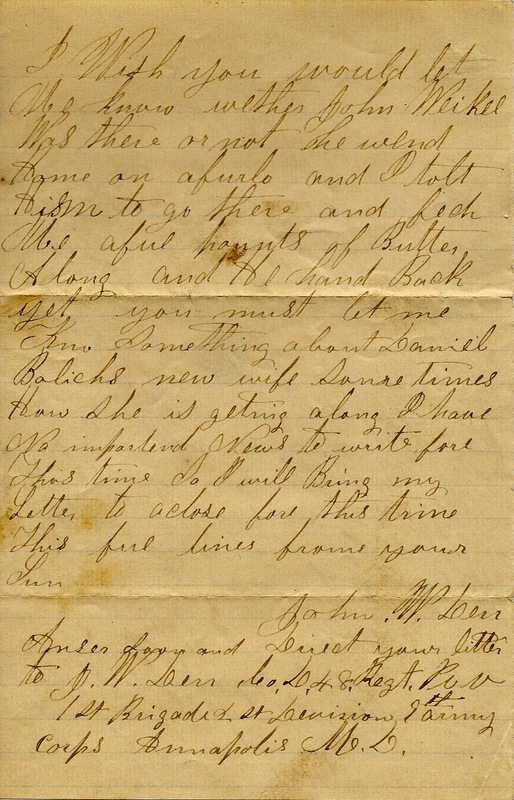 The letter also indicates that John's 17 year old brother, George was off to work on the Boyer's farm as a laborer...again...to provide cash for the family farm. John is giving his father advice on what kind of work George should be doing. With the war on, and many men away, there was a shortage of labors for county and state jobs. 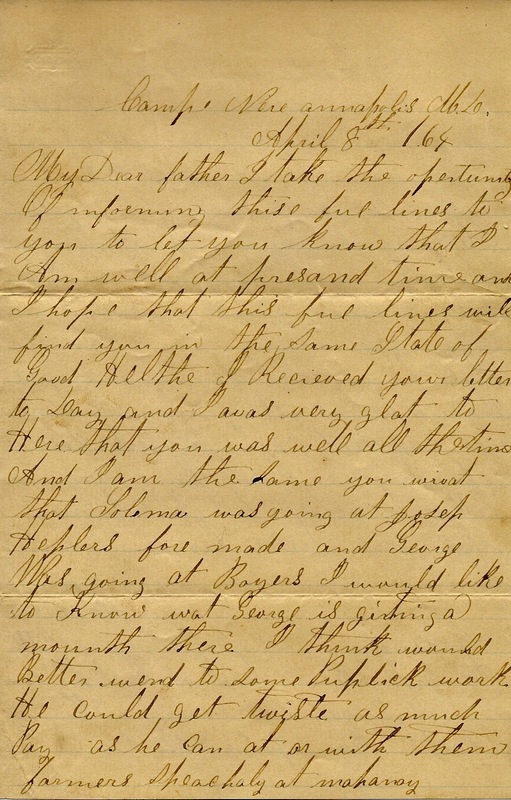 John suggests that George works that, rather than laboring on the lower paying Boyer farm. John is interested in the whereabouts of his cousin John Weikel. Weikel had returned home on a furlough earlier in March, and as was the typical of the time, was charged by John with carrying back articles from home. In this case...butter. Lastly, John is interested in knowing more about the recently married friend, Daniel Bolich, and his wife. 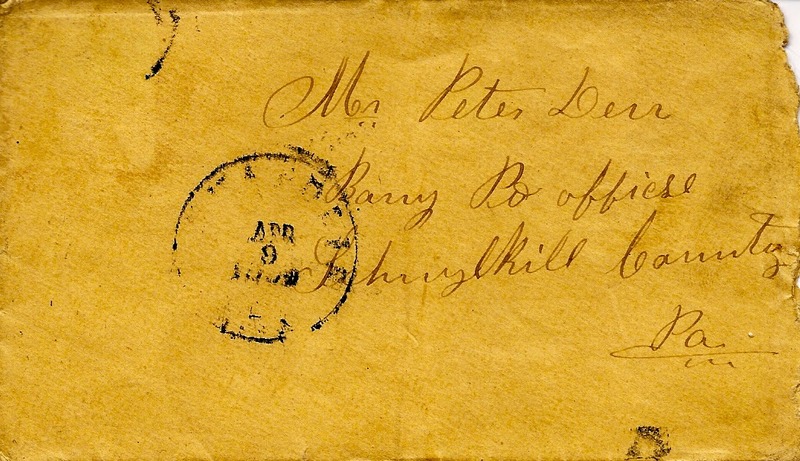 The marriage must have taken place sometime between the time the 48th left Pottsville and when this letter was written. I take the opportunity of informing this few lines to you to let you know that I am well at present time and I hope that these few lines will find you in the same state of good health. I received your letter today and I was very glad to hear that you was well all the time and I am the same. You wrote that Saloma was going at Joseph Heplers for maid and George was going at Boyers. I would like to know what Geroge is getting a month there. I think it would be better if he went to some public work. He could get twice as much pas as he can at or with them farmers….I wish you would let me know whether John Weikel was there or not. He went home on furlough and I told him to got there and fetch me a few pounds of butter along and he ain’t back yet. You must let me know something about Daniel Bolich’s new wife some times how she is getting along. I have no important news to write for this time, so I will bring my letter to a close for this time. This few lines from your son. Answer soon and direct your letter to J.W. Derr, Co. D, 48th Regt. Pa. 1st Brigade, 2nd Division, 9th Army Corps, Annapolis, Md.